It may be Halloween, but these Udi’s products are definitely not scary. 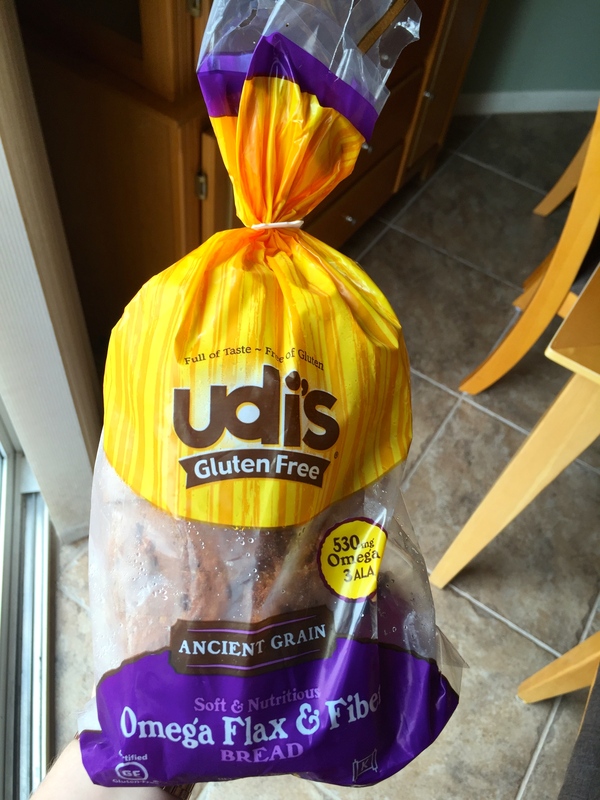 Since I’ve been gluten free, I have been buying Udi’s. I think it was actually one of the first brands I discovered after being diagnosed. All of their products are gluten free. I just want to talk about a couple of my favorites. First of all: bread! I love this bread; it’s frozen so it lasts a long time. I get the Omega Flax & Fiber kind, but they also offer White, Rye, and Cinnamon Raisin. The texture is really good (it’s fairly soft) and the taste is great. I eat this bread for breakfast every morning as toast and I never get tired of it! The size of the actual bread slices are pretty small, but I love that about it. 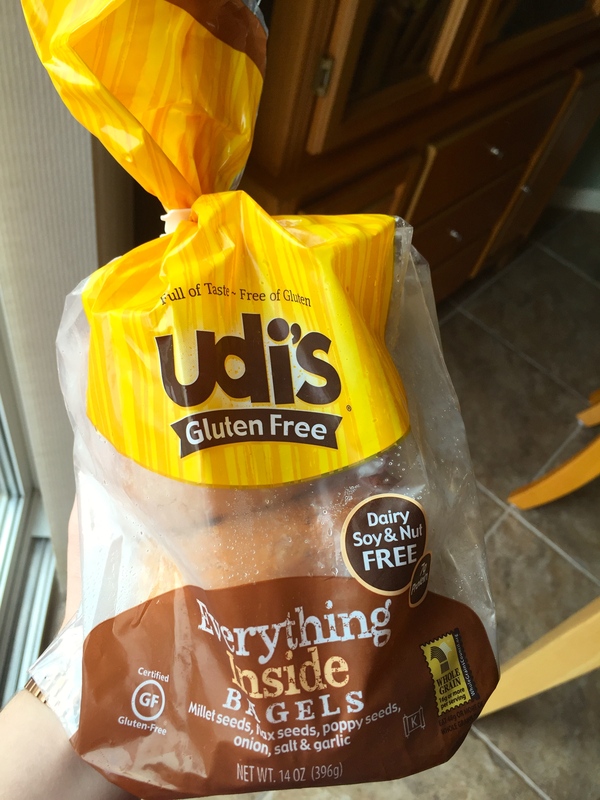 And while we’re talking about breads, I also like Udi’s hot dog buns. The only downside to them is that they don’t really hold up well so they fall apart pretty quickly. But despite this, it’s nice to have a bun for my hot dogs that tastes good! Second is the bagel. These are the only bagels I eat. My favorite is the Everything Inside Bagel, but I have also had the plain and a cinnamon raisin is available. The thing that always annoyed me about everything bagels, no matter how much I loved them, was that all the stuff on top falls off. But with the Everything Inside, everything that would be on top is—prepare yourself—inside. Shocking I know, but I love it and it is delicious! It’s very soft, and I like to toast it and use some chive and onion cream cheese (I’m getting hungry just thinking about it!). Next up is the pizza crust. This was more of a recent discovery for me, and I love it! Udi’s does also have pre-made pizzas, but I prefer to assemble it on my own. I go for the basics: tomato sauce, mozzarella, shredded parmesan and romano, and a little bit of herbs and seasonings, which is usually some basil, red pepper flakes, and garlic powder. The crust is so thin and crispy (which is probably why it’s called “Thin & Crispy”), and it tastes so good! Right now, it’s definitely one of my favorite pizza crusts! Finally, I want to talk about some of the little snacks and things that Udi’s has. I love the Chocolate Chip Granola Bars. They’re really tasty and great as an on-the-go snack. I also really like the Salted Caramel Cashew Cookies. I once crumbled these cookies up and mixed them in with some chocolate ice cream and put it into a GF pie crust and made an ice cream pie—it was awesome! My final favorite snack is the Aged Cheddar Ancient Grain Crisps. These are delicious, and a really nice thing to grab when you’re craving some chips! 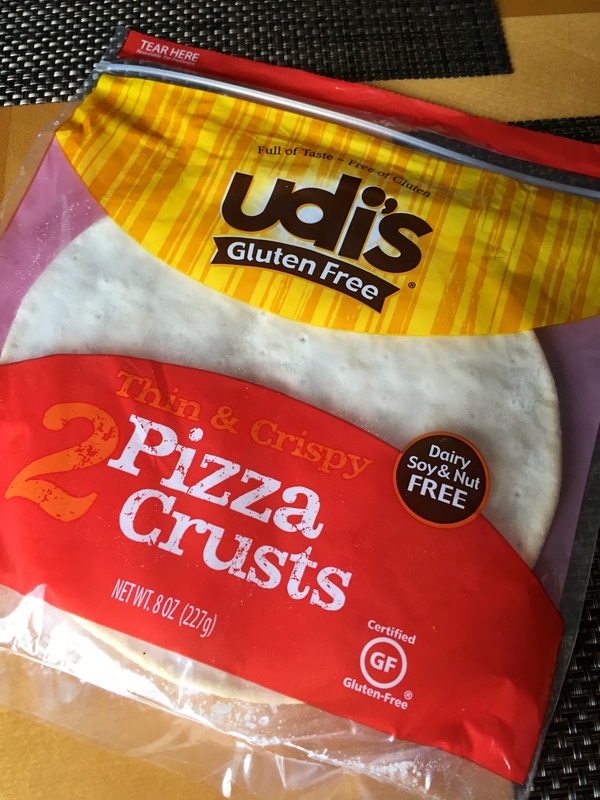 Udi’s is such a great brand with amazing foods. To anyone who is newly diagnosed, this is probably the first brand I would recommend because not only are their products great, but they have such a large variety! Earth Pizza has become my go-to restaurant for gluten free pizza. I love love love it, and they have everything! 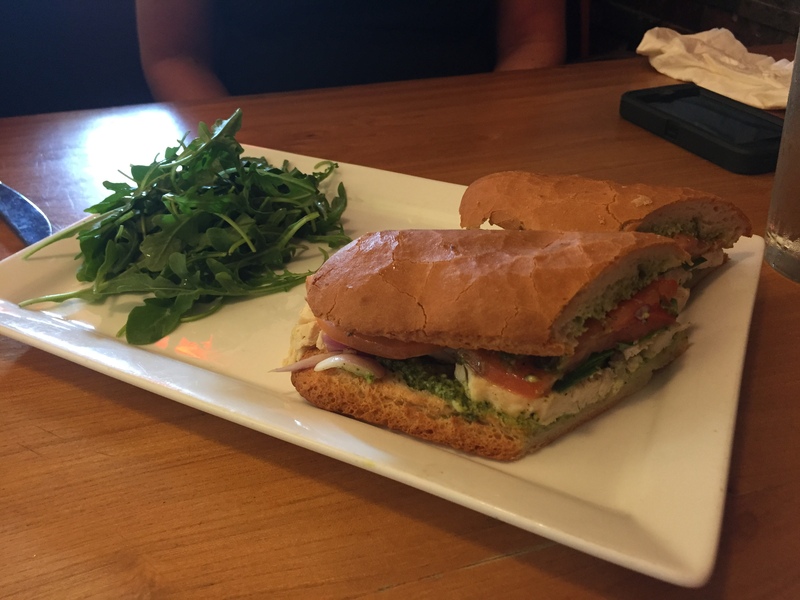 Appetizers, salads, sandwiches, pizza, and a large selection of desserts—basically, almost everything on the menu can be made GF. But this isn’t just any pizza place that offers some gluten free choices; they state on their website that they “have many gluten-free and vegan options available to allow folks with Celiac disease or special dietary needs to eat safely here at Earth Pizza.” They also “take great pride and care when serving our customers who have food allergies.” This is very reassuring to know that they create a safe kitchen environment to keep the gluten free foods actually gluten free, with no cross contamination. On this day, I visited with my parents. My dad and I both got personal size pizzas, my mom got a sandwich, and we all shared an order of the buffalo wings. If any restaurant I go to has GF buffalo wings, there is a 99% chance I will be ordering them, and at Earth Pizza, they are delicious. 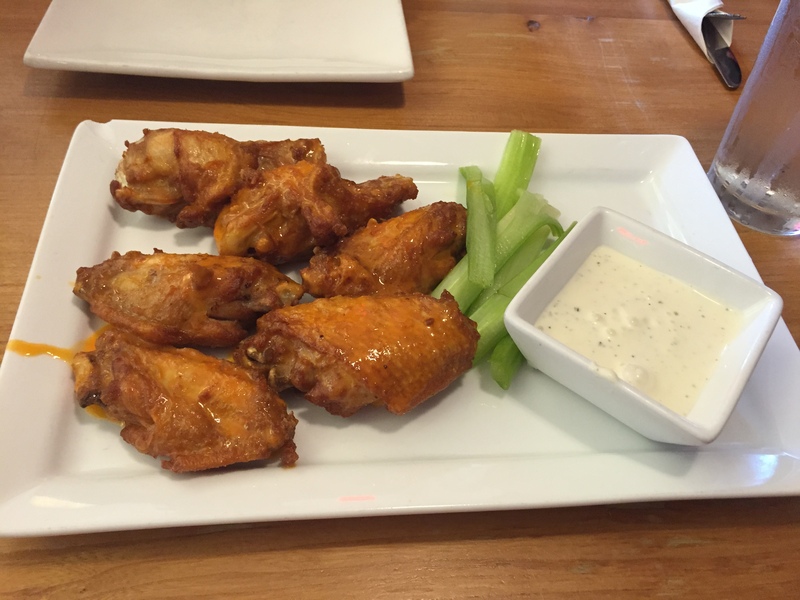 They have a nice, slightly crispy exterior and great flavor. 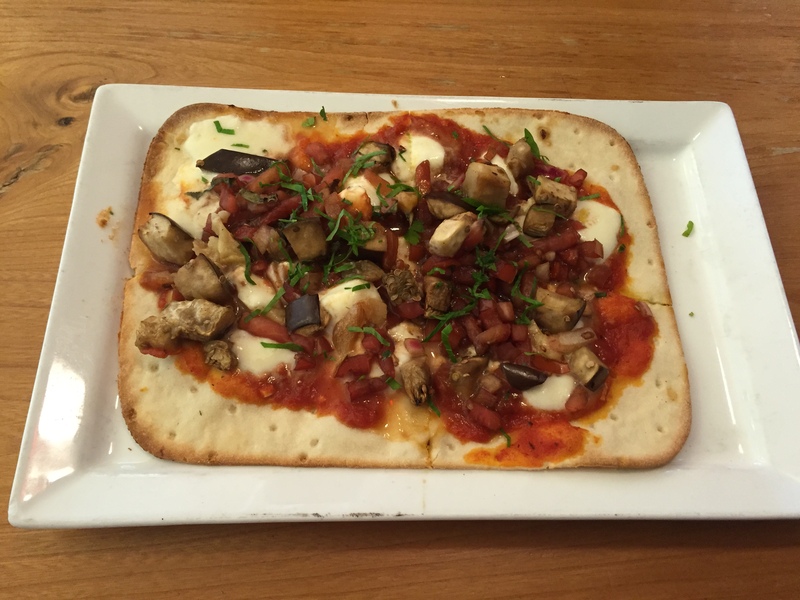 Another appetizer that we sometimes get is the 3-Dip Flatbread. I love the GF flatbread and my favorite of the dips are the tapenade, marinara, and hummus (see menu for other dip options). As for the pizza, I’ve been here so many times I’ve kind of personalized my order; I always get the Eggplant and Mozzarella pizza with no red onions, and with roasted garlic and bruschetta. It is so delicious, and the crust is nice and thin and crispy. 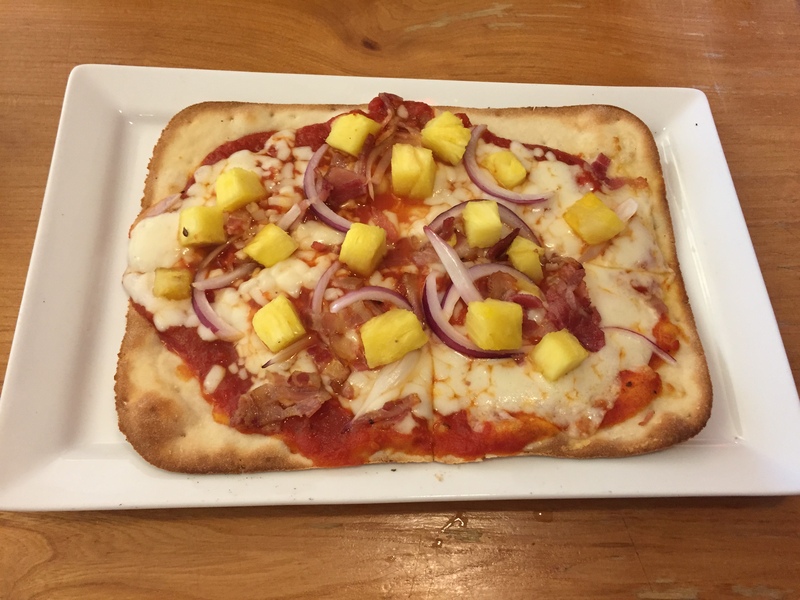 My dad got the Aloha pizza, which had bacon, pineapple, and red onion, and although I’m not a fan of red onions, I thought it was awesome. I am in love with all the pizza from this place. Some other kinds that I’ve tried are the Pizza A La Burger, the Margherita, and the Mediterranean, and all of these are also super tasty! This time was the first time I’ve ever tried a sandwich from here (the Chicken Pesto), and I realized that I have been totally missing out. I wish I’d had one of their sandwiches earlier!! The bread was so fantastic and soft, I would’ve just bought a dozen of those rolls right there if I could’ve. Not to mention what was inside the sandwich was just as fabulous. To finish off the meal, we ordered the Homemade Brownie and added some hazelnut gelato. This brownie was so good! The texture reminded me a little more of a cake than a brownie (it was a little fluffier than a brownie usually is), but that is definitely not a bad thing! The gelato worked really well with it, but was also just as good on its own. I also need to stress that Earth Pizza has one of the most extensive lists of GF desserts I’ve seen. 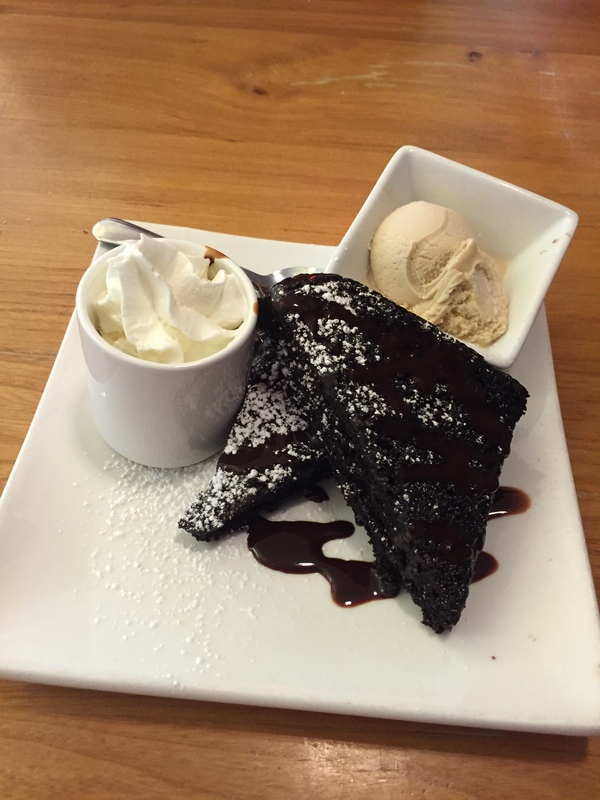 They offer 9 different dessert options that are or can be made gluten free, and that is A LOT! I really always feel so taken care of at Earth Pizza; it’s so nice to be able to have pretty much whatever I want and have so many options! For my first post, I thought I would start out with one of my very favorite restaurants! P.F. 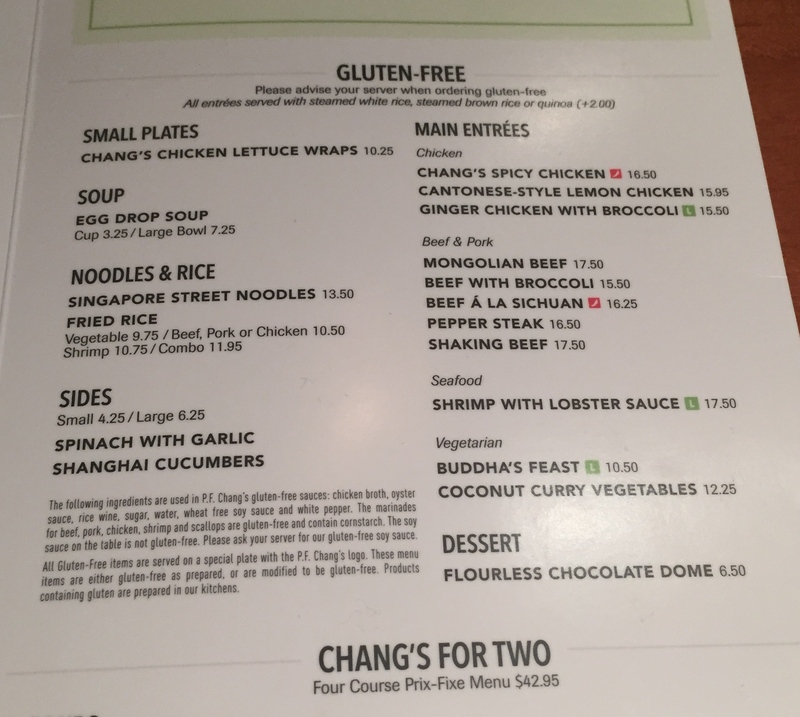 Chang’s has so many gluten free options, and they’re all listed right on the regular menu; no request for a special GF menu necessary. The food is fantastic, and as my lovely Aunt Cat states, “every dish I’ve eaten tastes just as amazing as their gluten-filled dishes.” And they really do, you won’t miss the gluten because you won’t even taste the difference. But you can see that it’s gluten free; they serve GF dishes on special plates and serve GF sauces in little red dishes. The staff are very knowledgable about gluten free, and we once spoke to the manager who informed us that they are very careful in their kitchen to prevent cross-contamination. My family and I go here so often that we have a regular order: chicken fried rice and Mongolian beef. These two dishes are so delicious I could go on forever. 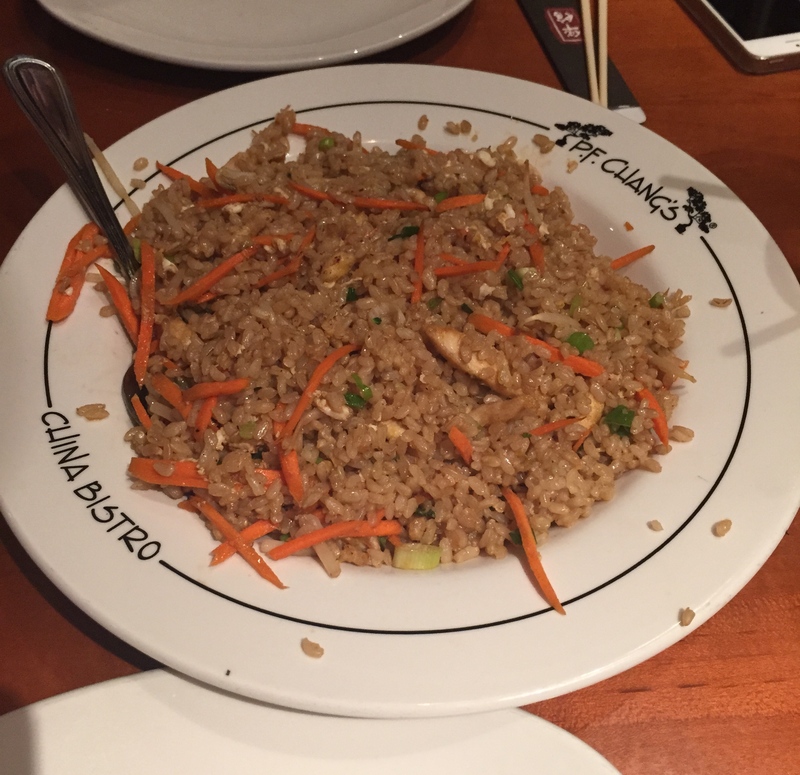 I personally love rice, so fried rice is a no-brainer. 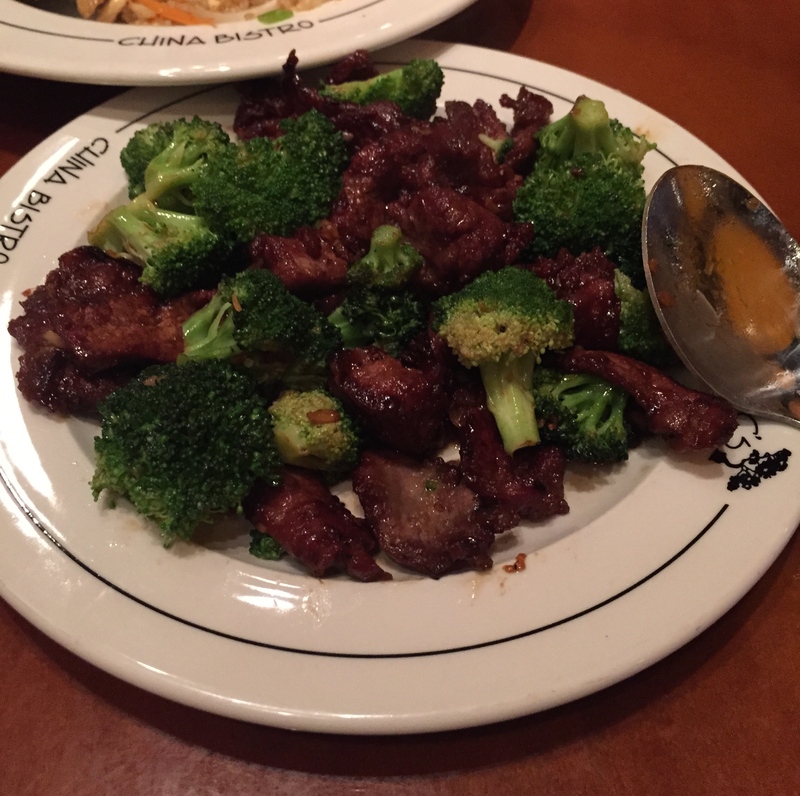 The Mongolian beef is described on the menu as “Sweet, soy-glazed 12oz sliced flank steak wok-seared with scallions and garlic” (we substitute scallions for broccoli just because we think it’s better). This seems like such a basic Chinese dish that you could get anywhere, but no one does it better than P.F. Chang’s! Occasionally we also get the Chang’s Chicken Lettuce Wraps as an appetizer, which are amazing. The chicken filling is so delicious and I love it so much. Some other dishes I have gotten that are just as great are the Singapore Street Noodles and Chang’s Spicy Chicken. 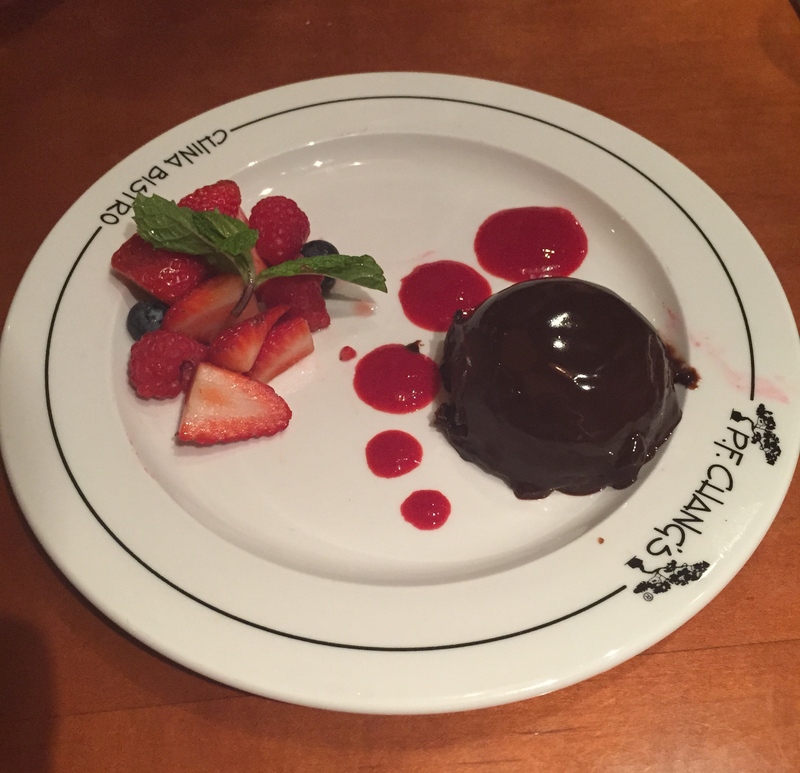 And for the times where I feel like treating myself, I get the Flourless Chocolate Dome, and WOW is it fantastic! It’s so rich and so chocolatey, which is perfect for someone like me who always has a weakness for chocolate. It’s nice that they offer this, as many other restaurants don’t offer GF desserts.